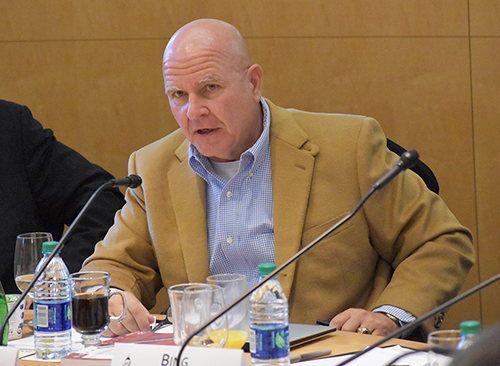 These changes produce a volatile international landscape, as members of the Hoover Institution’s Working Group on the Role of Military History in Contemporary Conflict acknowledged when they convened on October 5 for their fall workshop. Their task was to examine and discuss whether the United States is entering a new great power landscape with competition from China, Russia, Europe and even India. Titled “Great Power Rivalry,” the all-day meeting included dozens of scholars, historians, security analysts, and military personnel, as well as Hoover fellows and speakers such as John Yoo, H.R. McMaster, Niall Ferguson, and Russell Berman. A great power is a sovereign state that exerts influence on a global scale, whether through military, economic, diplomatic or “soft” power methods. Established six years ago, the working group is chaired by Victor Davis Hanson, the Martin and Illie Anderson Senior Fellow. It has held 12 sessions overall, with a mission to explore how knowledge of past military operations can shape public policy decisions in current conflicts. Agenda topics included the issue of who is a great power, China, Russia, alliances, Germany, Europe, and fading and emerging powers worldwide. The United States is in competition from authoritarian regimes to defend the American way of life, one participant said. Action, not inaction, in places like the Middle East, Asia and the Ukraine, is important. While China is a rising power, and Russia, a fading power, both are competing with the United States on different fronts. Understanding the present U.S. strategic context and how we got here after the end of the Cold War is critical for realistic policymaking. For example, as a declining power, Russia may be more apt for risk-taking and disruption on the world’s stage, another said. In regard to China’s economic aggression, the United States counter that with a sense of urgency, just as it must confront Russia over its destabilizing actions against the West. However, this must be done in a way that does not push Russia and China together as mutual adversaries against the United States. Overconfidence in the 1990s about America’s primacy in the world led to faulty assumptions and inadequate strategies about future enemies and conflict, someone added. This was true especially in Iraq and Afghanistan, and also further exacerbated on the home front by domestic episodes like the 2008 financial crisis. During the Obama Administration, this evolved into a defeatism attitude that made the situation even worse. Eventually, a mild streak of self-loathing about America’s role in the world permeated the national security team of that White House, a participant noted. This caused allies to lose faith in the United States. Today, however, America must compete in the global arena and, in particular, restore the all-important strategic concept of deterrence. America does exist now in a great power competition context, and for this reason, must carefully study history as lessons for the present. Other recent articles in “Military Issues in the News” published by group members include Peter R. Mansoor’s “Hama Rules Revisited”; Ralph Peters’ “Toe-to-Toe With the Russkis”; and Angelo M. Codevilla’s “Squaring Ends and Means,” among others. The group has published more than 200 such articles. Another project is “Classics of Military History,” which has produced more than 50 articles to date. As the full name of Hoover Institution makes clear, military history is central to the study of "war, revolution, and peace” and a safer, freedom-oriented America. "The overall mission of this institution is, from its records, to recall the voice of experience against the making of war, and by the study of these records and their publication, to recall man's endeavors to make and preserve peace, and to sustain for America the safeguards of the American way of life,” reads the mission statement.